I have always accepted that my kids are themselves, from day one. They are their own person, ones I am here to support, guide and love but the day they were born I knew that it wasn’t my job to tell them who or what to be. I love their uniqueness, their character and their individuality! And I love that they are who they are, not what society, or I say they should be. With being a weed though can come some lonely times. When you live in a small town, it can be difficult to find like minded peers, it can be pretty hard not being a bloom in a row. And be the weed growing outside the lines. Dude is doing school from home this year, and his best friends are on the other side of the computer screen. He misses his friends from school, and that was the toughest part of his decision, leaving his peers who accepted and liked him, uniqueness and all. I’ve struggled for years with the sadness that comes when your child says he has only one or two friends, and how it hurts a heart when that number drops. I just can’t wrap my head around it, I had tons of friends even if I was a weed, so it broke/breaks my heart that not everyone does. The truth is though, this is a blip in time one day soon he will find out there’s so many weeds, beautiful, unique weeds that he will fit with! It bothered me at first that his closest friends were ones he can’t physically see, I couldn’t wrap my head around how you can be so close to people you’ve never met. It boggled my mind. It’s something many won’t agree with us on, to much screen time blah blah blah. But here’s the thing, when your child has one maybe two friends, ones he doesn’t see often, I ask you what would you suggest? When you have a wonderful weed that instead of looking closely at people just pick, how would you handle it? You would probably be slowly coming to the same conclusion as I. 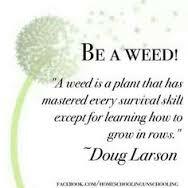 That even if we don’t understand the weeds ways, if they work, who are we to say they’re not ok?! As this group of friends grows closer, and we parents chat with them, I’ve come to realize that these kids are weeds in their world’s, but together they’re a beautiful garden. When dude explained that they make him feel confident, secure and accepted, I couldn’t help but be thankful. We are in a different age than I was as a teen, than you were or our parents. And I have come to realize I don’t care if friends are on the other side of the screen, I don’t care if they can come over and watch a movie. I care that my child is interacting, laughing and able to be himself in a garden of weeds, instead of having to pretend to be a flower in a row. I am thankful that technology allows for friendship to flourish no matter where you live. And if that’s not enough, him saying he hasn’t felt this good in years is. Funny thing what acceptance will do. *please note that I am not suggesting free reign to children and youth online. We closely monitor everything and recommend the same for parents. To me, and many it’s not a day. We don’t just talk about it for a day. It’s life. It’s semi normal conversation, albeit a crappy conversation. But a real conversation that must be had. It’s a conversation we find vital, and as important as any other. It’s a conversation that must be had. It’s not just a conversation, it’s so much more. It’s a touch, a hug, a tear, appointments, meds, doctors, frustration, anger, heart break and unimaginable sadness, it’s support and love, smiles and laughter. All in the hopes of keeping suicide at bay. Or yes ultimately preventing it. Yes it’s a difficult subject to talk about but one we must have. For so many reasons,and one that should be had by more people. So many have been touched, but it’s still such a taboo topic, and those who haven’t been affected simply don’t, can’t understand. So the conversation is important. Don’t tell me it’s not. Suicide is a topic that in my opinion should be discussed, as much as diabetes and cancer. To take away the shame, the blame and the non accurate assumptions and the judgement, the all mighty judgement that goes along it. So start talking. Today gives you the perfect opportunity. Our reality, the hardest of all realities for us to understand or accept is: we don’t know. 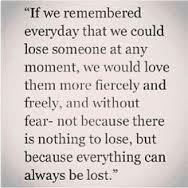 We don’t know how long our loved ones will be able to fight, battle, suffer and try before they can’t anymore. All we can do is support, love and guide. All we can do is hope. Every single day we hope we can some how prevent the tragedy that so many, to many, suffer. And to accept that we’ve done all we can, and will continue to do so and acknowledge and accept that sometimes we can’t prevent suicide. But please remember those who die of suicide or are thinking of it, haven’t just had a bad day. A day didn’t bring them to the last resort as a day won’t stop it. Prevention is everyday, not simply a day in September where we band together. But if it can get the conversation started, and resounding voices around the world, I am all for a prevention day. You are currently browsing the Bestkids's Blog blog archives for September, 2015.